So most people who know me or have spent five minutes chatting with me, know I have a little love affair with snacks and good food; that I often daydream about recipes or weird snack combos and always have something to nosh on in arms reach at all times. 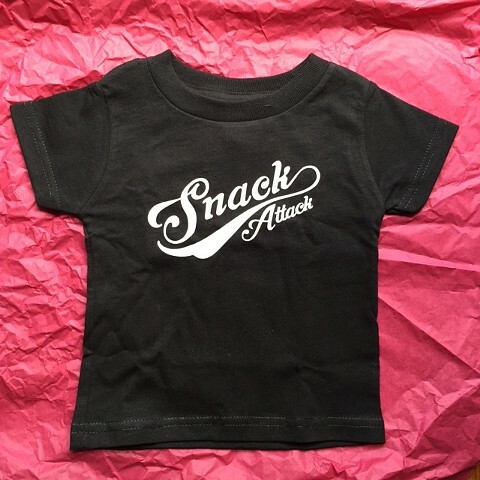 Out of this obsession with food was born the idea of the Snack Attack, a sort of frenzied excited state snacking can induce . Thanks to the lovely Jessica Cave, I have had a few t-shirts made to celebrate my love of food and sharing. Proceeds from the sale of the t-shirts will go to an organization that provides free meals to kids and teens when school is out for summer and regular meals are unavailable. or pick one up at the studio.